Image courtesy of Girls Who Code. 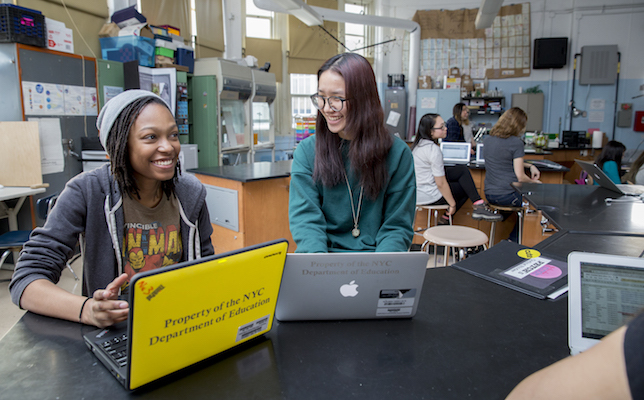 Girls Who Code (GWC), a national nonprofit that teaches young women computer science (CS) skills, is bringing its flagship CS summer program to 11 cities in the United States. The Summer Immersion Program is a free, seven-week summer course for current high school juniors and seniors. Participants learn the fundamentals of computer science, while getting exposure to the tech industry through the corporate partnerships. They gain first-hand experience coding and applying their skills to solve real-world problems. Projects have culminated in artwork, storytelling, robotics, video games, websites, apps and more, according to the program site. A gallery of student projects from the 2016 Summer Immersion Program cohort can be seen here. GWC will be hosting a total of 80 programs across Atlanta, Austin, Boston, Chicago, Los Angeles, Miami, Newark, New York, Seattle, Stamford, Washington, D.C. and the San Francisco Bay Area this summer. The program, which began in 2012, seeks to achieve the nonprofit’s overall goal of closing the gender gap in technology for women, who represent just 18 percent of all CS degree holders. Most participants (93 percent) have said the program fueled their interest in computer science and plans to pursue a major or minor in CS, according to the nonprofit. Dozens of program partners will host the GWC course at their sites, including Facebook, Expedia, Ford Motor Company, Pixar, Twitter, Sephora and the Walt Disney Company. Participants in Boston, for example, will be able to tour the Network Operations Command Center in Boston at Akamai Technologies, a cloud computing services company, to explore a different view of the internet. A list of Summer Immersion Program locations is available here. To learn more, visit the GWC site.